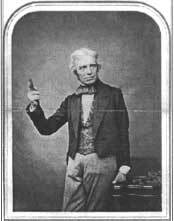 Michael Faraday was bon on September 22, 1791 in Newton Butts near London. In1813 he became an assistant to Humphrey Davy at the Royal Institution and three years later gave his first lecture to the RI and published his first scientific paper. In 1821 he discovered Electromagnetic Rotation and in the same year was elected a Fellow of the royal Society. At age 40 Faraday discovered Electromagnetic Induction that became part of the foundation of the modern electricity industry. Two years later he discovered the Laws of Electrolysis, still in use today. In 1839 due to overwork or possibly heavy metal poisoning the inventor suffered a physical and emotional breakdown but later at age 54 he discovered Diamagnetism and the "Faraday Effect". Due to ill health he declined the Presidency of the Royal Institute and in 1867, at age 75 Faraday died peacefully in his chair at Hampton Court.